Paul Dobraszczyk argues that all this isn’t just the material of sci-fi films and unreadable novels. An architectural drawing or city plan involves a kind of urban imagining, so it’s worthwhile to think about the links to practice. He writes, “Once a city becomes so large and complex that it exceeds one’s ability to comprehend it in a single mental image, then the imagination has to take over – to fill in the gaps in our mental perception of the vast urban environment” (pages 9–10). There’s a potentially subversive power in envisioning alternatives to the status quo. This doesn’t mean that there’s always an egalitarian bent to alternative-city fiction, though. For instance, there’s a disproportionate amount of climate fiction centred on cities that aren’t the worst affected by climate change, like Washington, DC and London (e.g. Paolo Bacigalupi’s Drowned Cities and J.G. Ballard’s The Drowned World). And urbanists like Vanessa Watson have written about how master plans and other forms of imagining urban development can be deeply exclusionary. 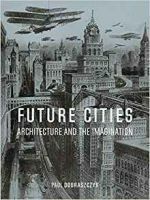 But overall, popular culture and architecture helpfully allow the public to see beyond the world’s environmentally precarious state: “The sheer uncertainty about the possible effects of human activity on the future of the planet forces us to reach for the imagination in sketching out these alternatives” (page 13). Watson, Vanessa (2013), “African urban fantasies: dreams or nightmares?”, Environment and Urbanization Vol 26, No 1, pages 215–231, available at https://journals.sagepub.com/doi/full/10.1177/0956247813513705. Yusoff, Kathryn and Jennifer Gabrys (2011), “Climate change and the imagination”, Wiley Interdisciplinary Reviews: Climate Change Vol 11, No 4, pages 516–534, available at https://www.academia.edu/1006118/Climate_change_and_the_imagination.